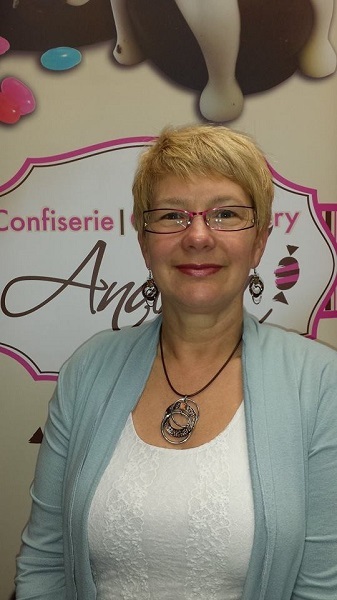 Andréa's story is one of love for confectionery, an experience that developed gradually, from humble beginnings, when she made her products to sell at the farmers' market in Tracadie. However, she really fell in love when she lived in Labrador, also with a small-scale production, and in-home demonstrations for an entire year. Once her two children were in school, the business was ripe for a point of service in a small 550 ft2 shop that subsequently expanded to 900 ft2. Andréa enjoyed ten successful years in Labrador before returning home, with a storefront in Bathurst. It's fair to say that Andréa wasn't born yesterday. Before returning to New Brunswick with her family, she barely had to lift a finger to sell her business in Labrador. No less than six buyers wanted to take over. That really says it all about how successful her business was. Now that she is established in Bathurst, this woman entrepreneur reveals the secret to her success: her passion for confectionery. When we ask Andréa where her energy comes from, she replies without hesitation: "It's more a passion than a motivation. There were no entrepreneurs in my family and I had to learn everything myself. I love customer service and sales. And when I love a product, I love promoting it even more!" "Creating your own job is also motivating, adds Andréa. You can't love everything, our opportunities are limited. Throughout my life, I tried several small jobs, for example administrative assistant, but I wasn't fulfilled. With my confectionery, I make my own schedule and find the necessary motivation within myself." However, returning to her roots in her native province didn't happen without a period of reflection. Andréa asked herself some questions before getting back into business. She was concerned about demand and the market for this type of product. Thanks to the support of the CBDC Chaleur, through the Self-Employment Benefit (SEB) Program, she was able to obtain financial support to gradually start her business downtown. In one short year, Confiserie Andréa became self-sufficient, even profitable. Another successful venture to her credit. The CBDC also provided her with training services, among others, to optimize her Facebook page. Andréa can also rely on the support of the Women in Business Initiative (WBI), with an officer from the New Brunswick Association of CBDCs who, according to her: "is always there to offer all kinds of advice, always ready to help me." Confiserie Andréa sets itself apart from its competitors: "Our competitors are essentially large-scale distributors. Here, the service is personalized, we have more extensive knowledge of the product, the freshness is second to none and we have a chocolate maker from Belgium who is carrying on a family tradition. The packaging service is entirely my creation. Packaging is critical for this product, since we eat with our eyes first. A polished presentation is something on which we never compromise!" Customer service is so important to the company that even universal accessibility was considered and wheelchair access provided. Andréa Duguay-Cormier is a woman entrepreneur who first and foremost perceives herself as an artist. She is inspired by colors and trends. Her advice for those who wish to start their own business: "Be passionate. In order to offset gloomy days, save any surplus for slower periods and manage wisely." After so many years, Andréa believes that no dream is too wild; a franchise may be in her future, you never know.